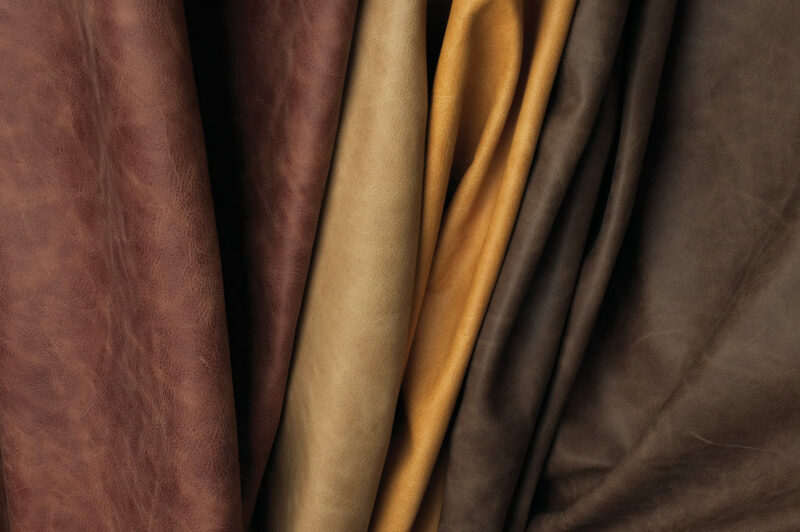 Pull-up leather is very popular, especially for residential, hospitality, and corporate settings. In order to fully appreciate this type of leather, it is important to understand its unique characteristics. While pull-up leather is similar to distressed leather, they are not exactly the same. 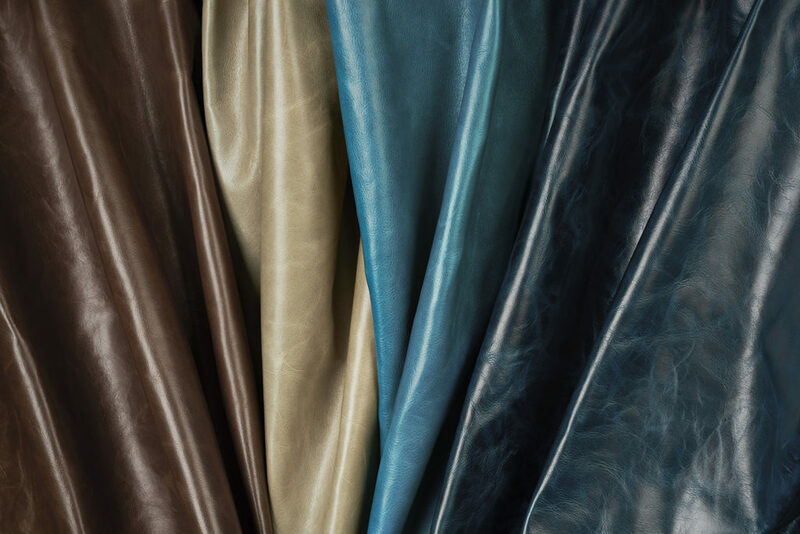 Pull-up leather is aniline dyed in the drum to create deep, vibrant colors. It is finished with a combination of transparent waxes and oils, which gives the leather a very soft hand, or feel. When this leather is stretched or pulled, the color migrates and becomes lighter in the pulled areas. Hence, the name “pull-up” refers to this change in color. Drastic variations in light and dark areas increase as the leather is handled and stretched against the grain. The “pull-up” becomes more evident as the leather is stretched tightly around furniture frames and other materials. As a pure aniline leather, marks, scratches, and signs of wear will show and a rich patina, or shine, will increase over time. What is the Difference Between Pull-Up and Distressed Leather? Pull-up leather has oils mixed in with the paraffin waxes and is applied to the surface of the hide with a roller. Then the hides are vacuumed dried. As a result, the leather has more sheen. When the leather is stretched or pulled, the oils on the surface cause the color migration and lighter areas to appear. The more pull-up leather is handled, the more it resembles distressed leather. Wrinkles and marks become inherent parts of the leather. While it is possible to rub out some scratches with the natural oils on your finger or thumb, most marks and creases incurred during handling become a lasting part of the product. Both pull-up and distressed leather are aniline dyed. However, distressed hides are tumbled in a drum with paraffin waxes to create variations in color and the signature worn or distressed look. It has a matte surface. Pulling distressed leather does not drastically lighten its appearance like pulling on a pull-up leather does. Whether you are looking for distressed leather or a pull-up, Garrett Leather has what you need. Our new Journey collection is pull-up leather that is in stock for immediate shipment. All 15 colors are GREENGUARD certified and offer anti-bacterial protection. Our Distressed collection is available in 18 colors, which are guaranteed in stock. Learn more about our Guaranteed In Stock program. Rely on Garrett Leather to make your delivery deadlines and your entire leather purchasing experience a smooth one, from start to finish. Be sure to request free samples for your next project. If you have any questions or need additional information, please do not hesitate to contact us. We look forward to working with you! More than just a leather company. Garrett Leather is your advocate working for your success. This entry was posted in Leather Education on July 13, 2017 by Garrett Leather. Great blog provided me great information about pull up leather the differentiation methods you are so great I’ll be glad to read more of your blog in future cheers to your work thanks for such a great blog.